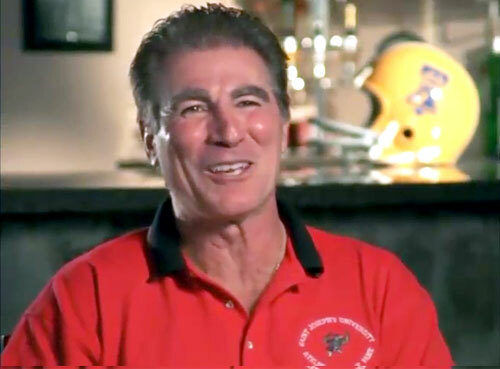 Vince Papale is a former NFL wide receiver who played for the Philadelphia Eagles from 1976 to 1978. Vince Papale was 30 years of age when he began his NFL career becoming the oldest rookie in NFL history who never played college football. Papale was the inspiration for the 2006 Disney film, Invincible, in which he was portrayed by Mark Wahlberg. In 2001, Papale was diagnosed with colorectal cancer and has since recovered from the disease. He has appeared in commercials to encourage people to get regular check-ups. PFP Sports Talent Agency is a top booking agent for motivational sports speakers and sports personalities. If you would like to book NFL stars like Vince Papale for a speaking engagement, personal appearance or special event, you can request Vince Papale agent and speaker information from PFP Sports Talent Agency or call 800.966.1380.